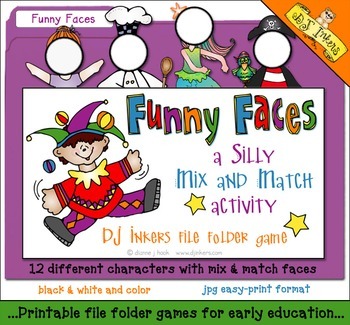 Kids will LOVE our silly NEW file folder game, 'Funny Faces!' This cute (& hilarious) activity lets kids mix and match faces to the characters on the game-board. Great for parties, getting to know you, classroom centers or free time. 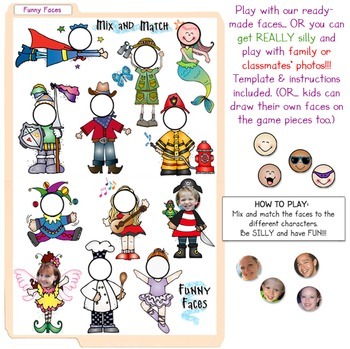 Play with our ready-made faces... or get REALLY silly and play with family or classmates' photos (template & instructions included). All pages are included in black & white and color. Just print, cut & glue to an empty file folder. See below for game sample & larger image. All pages are included as high quality 8.5"x11" .jpg files, in both color and black & white (.png file with photo windows included for game cards). Cover, folder labels & instructions included. Laminate for best results.